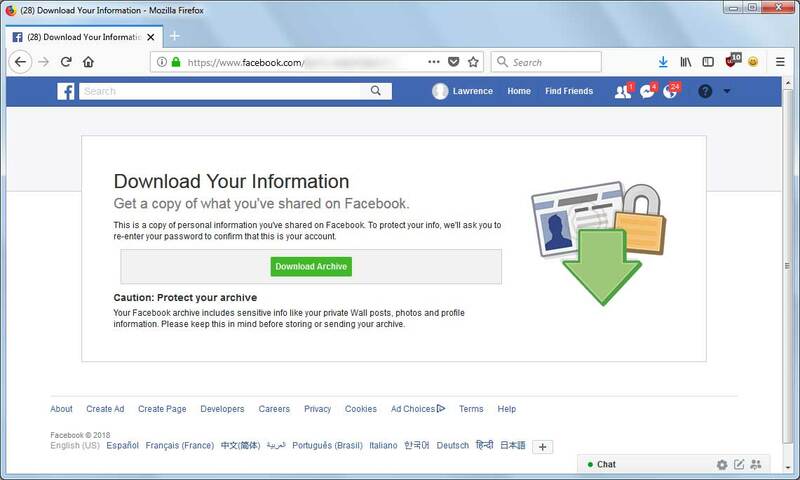 For some security reasons, Facebook offers its users the ability to backup a copy of their Facebook data and download it to their local computer. This data includes your photos, videos, messages, posts and chat conversations with friends, your profile file, and information stored in the about section. To create a backup and download it, open the Facebook menu by clicking on the down arrow next to the question mark in the Facebook navigation header as shown below. Alternatively, you can click on this link to open the General Settings page. Once the menu is opened, click on the Settings link and then make sure you are viewing the General Account Settings as shown below. At the bottom of the above settings, you will see a link titled "Download a copy of your Facebook data". Click on this link to begin the process of creating a backup. As part of this process, Facebook will first prompt you to enter your password before creating the archive. This is to ensure you're the real account owner. It will then begin to create your data backup, and when it's finished, it will email you that the data backup is ready to be downloaded. You can now go back to the General Account Settings page and click on the "Download a copy" link again. This time you will be presented with a screen that states your backup is ready. If you click on the Download Archive button, you will be prompted to enter your password and then the backup will be downloaded. This download will be sent as a zip archive and will contain numerous folders and files that contain your data. Any textual data will be stored in HTML files and images will be stored in separate image files. For example, all of your timeline posts will be contained in a html file called timeline.htm as shown below. 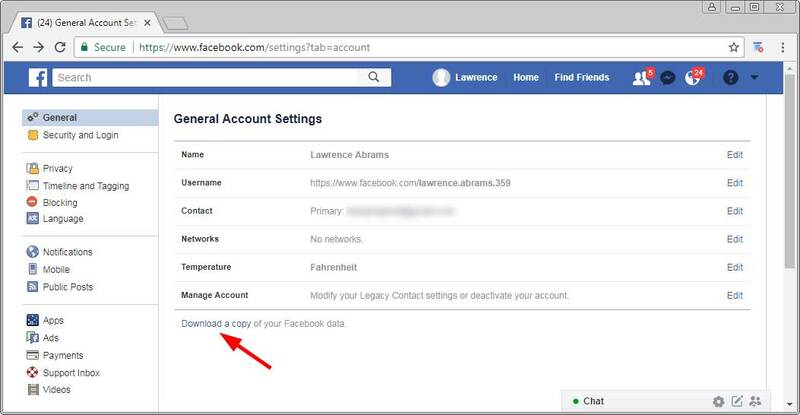 Now that you have a backup of all your data, if you wish to deactive or delete your Facebook account you can do so without losing your data. I hope this post was useful to you.